Flexagons are folded paper constructions that are fun to flex to reveal hidden pictures. Tetraflexagons are square. The simplest is the tritetraflexagon, which has three square faces. Hexaflexagons are hexagonal. The simplest is the trihexaflexagon, which has three hexagonal faces. A hexahexaflexagon has six hexagonal faces. The faces appear in different orientations. It is fun to flex a flexagon and try to find all faces in all possible orientations. Instructions for making and flexing a hexahexaflexagon. A blank hexahexaflexagon pattern. 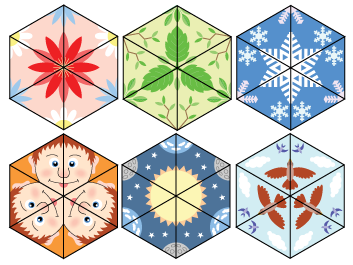 Decorate your own hexahexaflexagon. 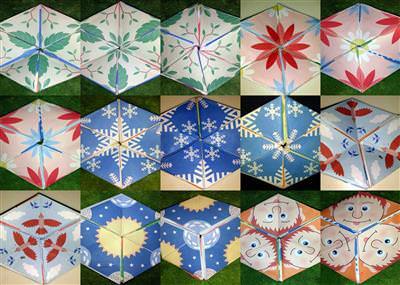 A decorated hexahexaflexagon pattern with six faces: flowers, leaves, snowflakes, faces, planets, and birds. The decorations are designed to make it easy to identify the six faces and their different orientations/configurations. The three primary faces each have three configurations. The three secondary faces each have only two reachable configurations. Can you find all 15 configurations by flexing your flexagon?